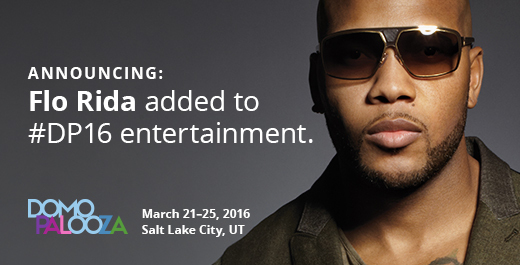 SILICON SLOPES, Utah – January 21, 2016 – Today Domo announced that award-winning artist, Flo Rida, will perform for attendees at Domopalooza™ 2016. Flo Rida has been nominated for almost every major music award with a discography of chart-topping rap and dance music hits that include “My House,” “Low,” “Wild One” and “Good Feeling,” to name a few. Today’s announcement is the first of many Domo will make around its inspirational lineup of Domopalooza keynotes, featured speakers and customer experiences. Now in its second year, Domopalooza is designed to educate, inform and inspire Domo’s fast-growing community of users from the world’s most progressive organizations and most recognizable brands. It is being held March 21-23 in Salt Lake City. Last year, Domopalooza featured leading business visionaries, data practitioners and entertainment headliners such as Sheryl Sandberg, COO of Facebook; Billy Beane, GM of the Oakland A’s and subject of MoneyBall, the movie featuring Brad Pitt; Rita Sallam, VP for Gartner; Jer Thorpe, award-winning data artist; plus Ludacris, Robin Thicke, Kid Ink and the original Beast Mode, Marshawn Lynch. The inaugural event attracted more than 1,300 attendees who were director-level and above across organizations ranging from SMBs to enterprise. Domo is anticipating more than 2,000 senior-level attendees this year. From keynote presentations to hands-on personalized training and breakout sessions, attendees will gain valuable lessons from industry experts and fellow customers. They’ll gain new insights on how to best leverage Domo, their growing universe of business data and industry best practices to operate more efficiently and effectively to improve business results.